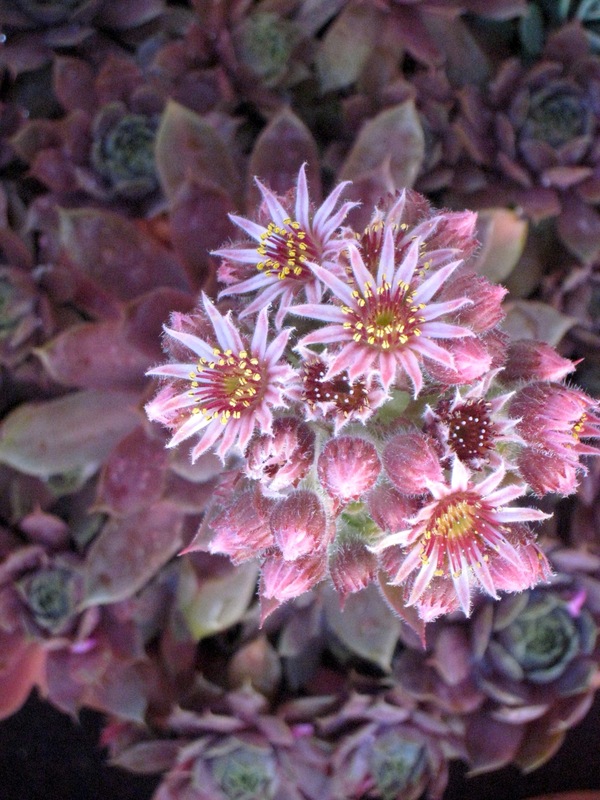 In early June, our sempervivum — also called a houseleek or hen and chicks — seemed sleepy. 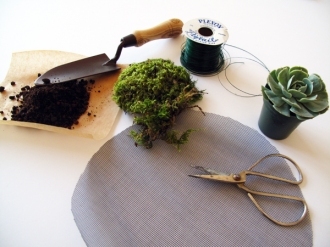 We were told the sempervivium is excellent plant for a New York City roof garden — enduring the intense heat, the freezes and thaws of winter and the wind without complaint. I realized last week that this plant was definitely up to something. Now our sempervivium is blooming. I have to admit I almost threw this plant out this spring. I couldn’t really tell if it was alive or not. It was the pet rock our roof garden — just taking up space, space that I could use for flowers or something more showy. 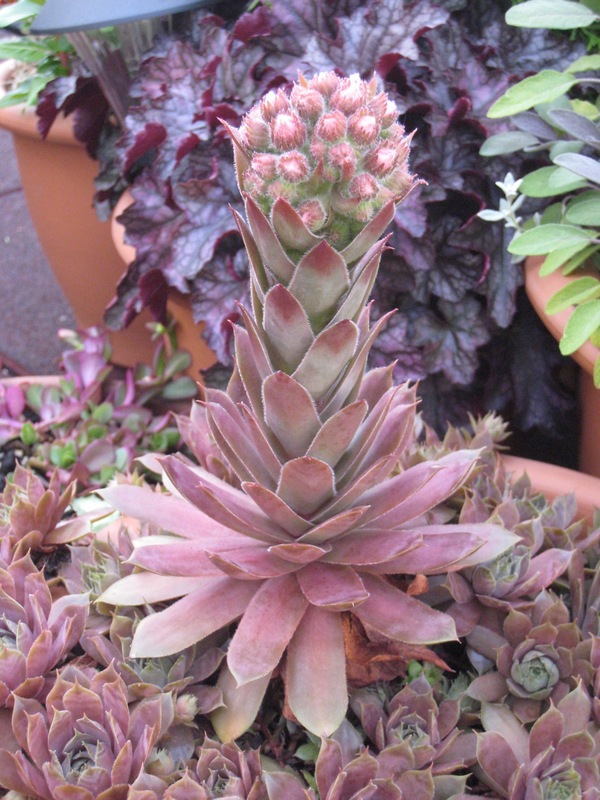 Now, after reading the sempervivums chapter in Joe Eck and Wayne Winterrowd’s excellent Our Life in Gardens, I am fascinated by our pot of “semps.” Turns out that these plants have a long history of growing on roofs. “In the ninth century, Charlemagne … issued an edict that sempervivums were to be established on every house roof,” says Our Life in Gardens (here’s a sample in Google Books). I didn’t know why these plants were also called Houseleeks until I read Out Life in Gardens: “houseleek was also a pun, since the most decayed roofs of houses both supported the plants best and could be presumed to leak.” Leek, leak, get it? 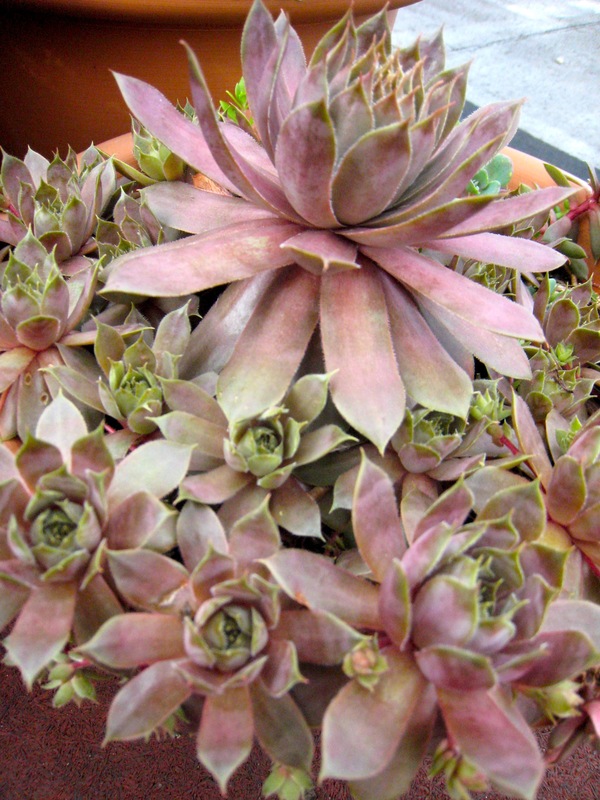 “After flowering, the plant dies, usually leaving many offsets it has produced during its life,” says Wikipedia’s houseleek entry. With that in mind, I chopped off thee chicks. I’m trying to establish a new hen and chicks colony in the dry difficult conditions of the containers on our apartment buildings front stoop. I spent Sunday morning nursing my sad succulents. Then, I went to the International Contemporary Furniture Fair in the afternoon. The very first thing I saw were these stunning succulent garden centerpieces in the press room. They are from Brooklyn’s own Alive Structures. The containers are hand made in New York from recycled shredded paper and mixed with cement. The good news is that you can buy these at the Alive Structures office. 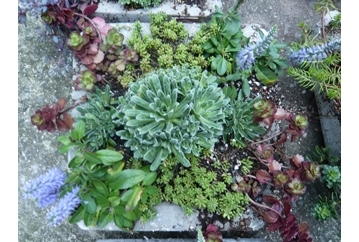 There were amazing sempervivums and sedums at the Brooklyn Botanic Garden plant sale. 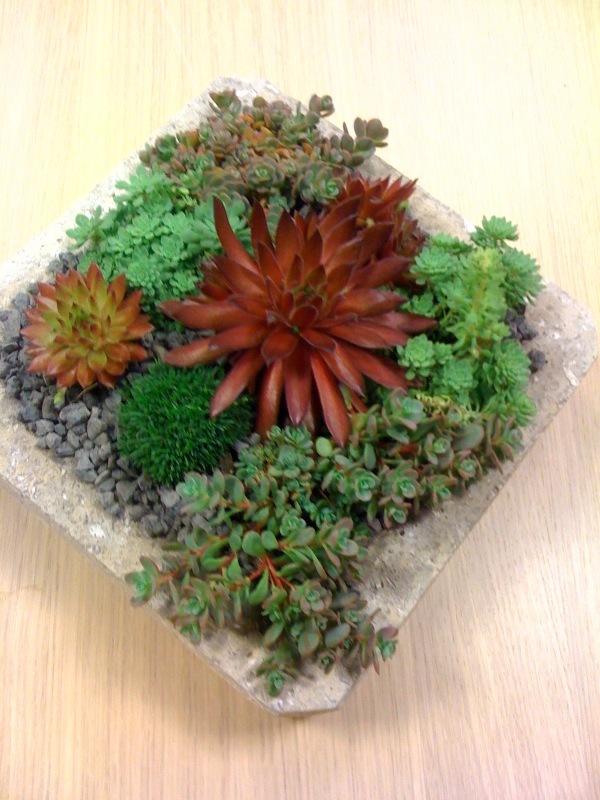 I decided I could create one a succulent dish gardens inspired by a Deborah Lee Baldwin’s new book: Succulent Container Gardens. Unfortunately, I didn’t have any of the other items I needed when I bought the plants. 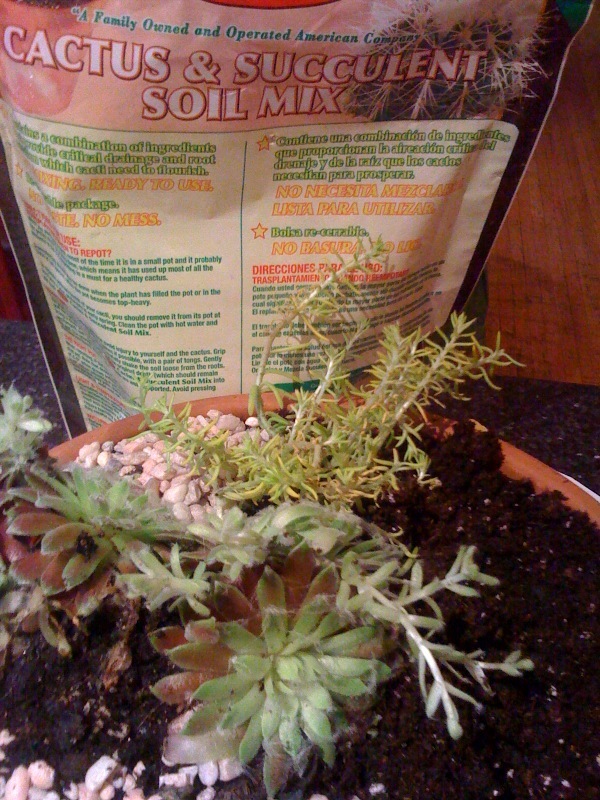 It took me two weeks to get a low terra cotta bowl, fast-draining succulent potting soil, and a bag of little rocks. I went to put the stunning Sempervivum ‘Baronesse’ (hens and chicks), grown by Glover Perennials in Cutchogue, NY, into the pot and I saw a few little flies and smelled rot. Oh no! This perfect plant with cobweb rosettes and red highlights was rotting from underneath! It was too wet and not getting enough light. I feel guilty for not being a better parent to these perfect plants. I removed the rotting leaves, popped it in the pot with some spindly sedum (also in need of more hot sun!) and placed it a sunny and isolated spot on our roof. I don’t want the few flies to spread to my other pots! I hope a few days baking in the sun can nurse this plant back. I’d like to use it as the centerpiece for the patio table on our roof garden. The bug candle we used on our roof garden last summer stinks. Light it up and it throws off a totally overpowering citronella smell. We’re ready for something different and just might try this candle ($56) from Hillhouse Naturals. They promise it will keep the mosquitoes away naturally, with either Eucalyptus, Mint Leaf and Lemongrass; or Wild Mint, Juniper and Tea Tree scents. 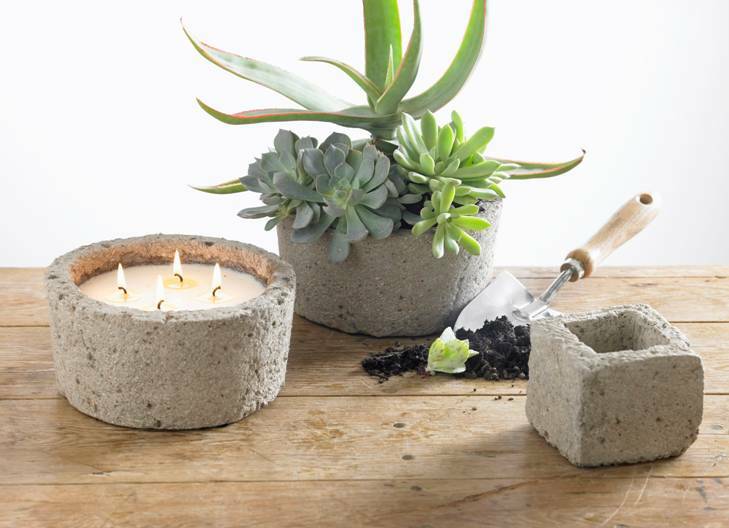 And when the candle is finished, the concrete planter would be great for a succulent garden. We love the cover of the new CB2 catalog. Since when are guys shown gardening on the cover of a national catalog? 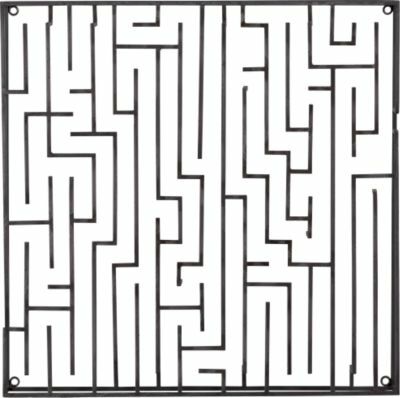 Isn’t it cool how they use this metal maze wall hanging thing as a way to create a simple green wall effect, using air plants and succulents. We like the CB2 Julep rocker in this photo too. There’s a step by guide on how to make this green wall on the CB2 site. We’re considering adding a green wall to the blank backwall of our roof garden. 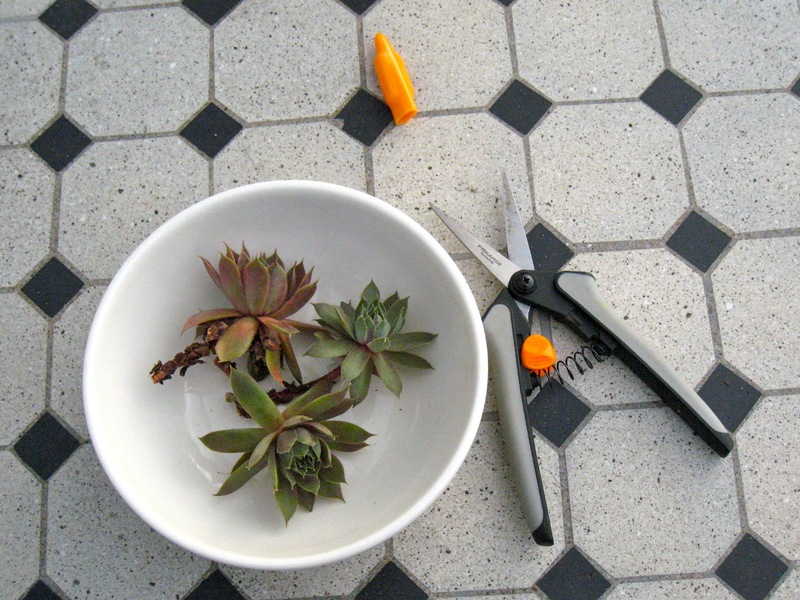 We found these step-by-step succulent wall instructions over at Sunset Magazine’s excellent gardening section. 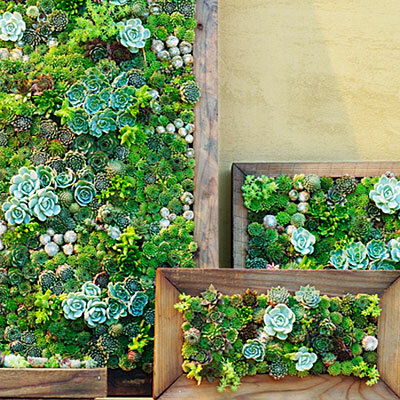 The article also links to the amazing Succulent Gardens. What an inspiring store! Now the trick will be to translate all of this sunny California gardening advice for our Brooklyn roof garden.